First phase of the two year project will be the construction of a 50-km stretch of fence north of Tze'elim. Work on construction of a fence along the Israel-Egypt border is to begin Monday. The first tractors and heavy machinery will commence work on the obstacle, which is to block the influx of infiltrators that has plagued Israel in recent years. The fence is planned to stretch over 150 kms, and will be fitted with cameras and other technological devices that will make it possible to locate infiltrators. The project is to last two years. The first 50-km stretch of fence is to be constructed north of Tze'elim in the Negev. This area is the scene of relatively large-scale infiltration by migrant laborers from sub-Saharan Africa and by weapons smuggling gangs. 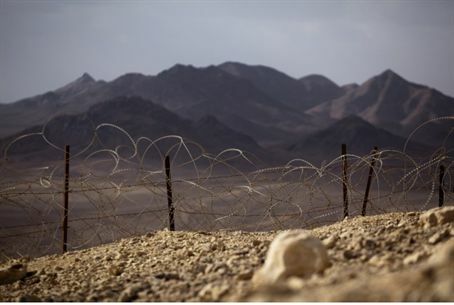 The fence project is being undertaken by the Ministry of Defense, based upon a March cabinet decision. Work was slow to start, however, and last month the Prime Minister's Office published a statement prodding the officials responsible for the project to begin work as soon as possible. The cabinet decided that it would be supervising the pace of construction of the fence. The proposal to construct the fence was put forth by a Knesset committee headed by MK Yaakov Katz (National Union), which was appointed to look into the foreign laborer problem. Members of Defense Minister Ehud Barak's party have been active in leftist protests against the expulsion of foreign laborers. Cynical observers believe the Israeli Left wants as many inflitrators as possible to enter Israel, in the hope that they will eventually be naturalized and enlarge the Left's dwindling voter base.